We received an RSS news feed today from a discussion in a real estate investment forum. A new investor was confused by what is actually included in "operating expenses" for a rental property. Obviously, as with any operating business, we will have income and expenses. One must be careful to understand what is normally included in operating expenses for a rental property. Actually, the part that bites some new investors is what is NOT included...the mortgage. And, since a monthly payment is necessary for non-cash purchases, the "debt service" as it is called, is a major component of cash flow, positive or negative. The goal of successful real estate investment is a positive cash flow, while also realizing the other benefits of real property ownership and investment. These include appreciation in value, tax breaks, and other benefits. However, when you're evaluating possible rental property purchases, and you see a figure in the financials for operating expenses, there isn't any mortgage payment in that number. You'll not only have to pay those expenses but also your principal and interest payments as well. So, be sure to analyze the "cash flow" of the investment with great care. 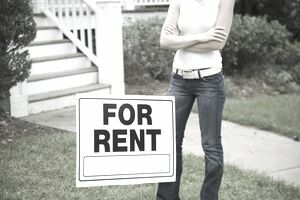 Marketing and advertising: When you run ads for tenants, you can deduct the expense, as you also can do for hosting and expense of a website or blog dedicated to your rental property business. Property taxes: Though they may be in the mortgage payment, you break them out and deduct them in the year paid. Property insurance: Though they are probably also escrowed and in the payments, the annual insurance premium is deductible as an operating expense. Utilities: Any utilities that you pay, usually water and sewer, you can deduct as operating expense. Trash collection: This is usually a monthly municipal charge, and it is a valid operating expense. Property management: If you hire professional management, you can deduct the cost in the year paid. Maintenance and repairs: You can't deduct major depreciable items like renovation, but you can deduct normal maintenance and repairs to the home. Landscaping, pool care, etc. : These are operating expenses and deductible as well. Accounting and legal: Fees you pay an accountant or attorney related to your rental property(ies) are deductible as operating expenses. Snow removal, pest control, etc: These are valid operating expense deductions for a rental property. The IRS allows you to depreciate a rental home over 27.5 years. Take the value of the home (subtract out the land value) and divide it by 27.5 to get the annual amount you can take as a deduction. Remember, this is money you really haven't spent, just a calculation for tax purposes. This is one of the advantages of rental property over stocks and bonds investing. Monthly positive cash flow is the primary reason most investors choose rental property as their real estate investment niche. It's great income in retirement, and they're building equity in the property as well. That monthly check multiplied by several rental properties is funding some lavish retirement lifestyles out there. Anyone considering real estate investment can get excited about flipping houses when they see the gurus on TV. But, it's that steady income from rental property that is really exciting and long-term.